Day 1: New Delhi:Arrive early in morning in New Delhi and drive straight to hotel. Relax for some time, get fresh and have a sumptuous breakfast. Later, embark on a sightseeing tour of New Delhi. Start with Qutab Minar and other ancient and medieval period monuments surrounding it. Together they have also been included in the list of UNESCO World Heritage sites. Qutab Minar is some 73 meters high and a symbol of the Delhi Sultanate period. Other famous monuments in the Qutab Minar complex include the Iron Pillar of Delhi, Quwwat-ul-Islam Mosque, Alai Darwaza, the Tomb of Iltutmish, Alai Minar, and Ala-ud-din’s Madarsa and tomb. Day 2: New Delhi – Jaipur: Check out from the hotel in New Delhi very early in the morning and drive to the railway station to catch train to Jaipur, capital of Rajasthan. Check into a hotel on arrival. Take some rest. Afterwards, set out to explore Jaipur. Begin the city tour with a lunch at one of the restaurants. After a delicious lunch, visit City Palace, which has served as the royal residence and capital from 1727 onwards. Descendants of Royal family still lives here. There is a big museum which is open for public viewing. After a visit to City Palace move to Jantar Mantar, a collection of 19 architectural astronomical instruments, built by the Rajput king Sawai Jai Singh II in 1734. Day 3: Jaipur: After breakfast at the hotel embark on a full day city tour. Start the day with a tour to Amber Fort, the earlier capital of Jaipur Royal Family. Take an elephant ride to reach the top of the hillock where Amber Fort is located. Take a full tour of the Fort, which is made in red sandstone. Take a look at Diwan-i-Am Hall, Sheesh Mahal, Jas Mahal, the Queen’s chambers, King’s place, courtyard, and the hidden passage. Day 4: Jaipur – Udaipur: Check out after breakfast and start for Udaipur, a long drive of over seven hours. On the route stop at Chittorgarh, a historical place famous for its association with Maharana Pratap. One of the largest forts of India is in Chittorgarh. Have a tour of this fort after a delicious lunch at a local restaurant. Look at the massiveness of the fort and try to gauge how the Mughals might have tried to take over it. Later, move to Udaipur, some two hours journey from Chittorgarh. Check into a hotel on arrival in Udaipur. Relax and take the evening as leisure. Have walks in the hotel campus or go on to the local markets. Have a nice dinner. Overnight in Udaipur. Day 5: Udaipur: After breakfast embark on a full day sightseeing tour of Udaipur. Start the day with a tour of the City Palace of Udaipur. It gives a great insight into the historical facts of the Udaipur ruling family. Give some time to explore Government Museum located close to City palace. Thereafter, take a boat and go or boating in the Lake Picchola. Also enjoy boating in Lake Fatehsagar. Jag Mandir is a nice place to rest for some time. After a nice lunch go on to visit Eklingi Temple, temple of the Maharanas. Set on the banks of Lake Bagela near the Eklingi Temple is the small hamlet of Nagda, one of the earliest capitals of Mewar. The twin temple complex, though in ruins now and often referred to as Saas Bahu Temple, is a charming place to visit for tourists. Afterwards, go and visit Saheliyon ki Bari which was once used by women of royal family for their leisure and entertainment purposes. Towards the evening go and enjoy Bagore Ki Haveli light and sound show. Have a nice dinner at one the restaurants. Overnight in Udaipur. Day 6: Udaipur – Kumbhalgarh – Ranakpur: Check out from the hotel in Udaipur and drive to Kumbhalgarh, a drive of around 2.5 hours. Kumbhalgarh is a Mewar fortress built by Rana Kumbha in the 15th Century on a hilltop in the Aravallis. Listed among the UNESCO World Heritage sites, Kumbhalgarh was the birth place of Maharana Pratap. After an extensive tour of the Kumbhalgarh Fort, have lunch at one of the restaurants ir resorts in Kumbhalgarh. Afterwards, start for Ranakpur, located around 35km from Kumbhalgarh. Check into a hotel or resort after reaching Ranakpur, a place famous for its Jain temples. After some relaxation at the hotel, go and visit Chaturmukha Jain Temple, the reason for the fame of Ranakpur. The temple, built sometime in the 15th Century, is built on a lofty plinth. Intricate carvings in the temple are quite impressive. Also visit Surya Narayan Temple, which is close to the Jain Temple. This temple is supposed to have been built in the 13th century. Return in the evening to the hotel. Have a nice dinner. Overnight in Ranakpur. Day 7: Ranakpur – Jodhpur: Check out after breakfast from the hotel in Ranakpur and transfer to Jodhour, a drive of around 3.5 hours. Settle in your room and get refreshed to start a sightseeing tour of Jodhpur. Start with a visit to Mehrangarh Fort. Set on a rocky outcrop Mehrangarh Fort, built in 15th Century, overlooks the walled city where most of the buildings are painted in blue, giving Jodhpur the iconic name ‘Blue City’. The fort has now been turned into a museum where lots of paintings, artworks, weapons, cannons and royal belongings can be seen. Opposite to the fort, at a walking distance of hardly 10 minutes, is Jaswant Thada, a cenotaph built by Maharaja Sardar Singh in memory of his father. This is a beautiful monument built in white marble with a peaceful ambiance and a nice garden. After a well deserved lunch, resume the sightseeing of the city. Go on to explore Rao Jodha Desert Park. This lies at the foot of Mehrangarh Fort and is spread over 70 hectares. You can enter the Park from close to the main Fort gate. There are well laid pathways to trek the entire area of the Park. You must enjoy a tour of the zip lines, called Fly Fox. Finally before you head to the hotel, go and visit Clock Tower, locally called Ghanta Ghar. This is one of the oldest markets of Jodhpur. After a tour of the market and an exhausting day out, return to the hotel. Have a nice dinner. Overnight in Jodhpur. Day 8: Jodhpur – Jaisalmer: Start for Jaisalmer after an early breakfast at Jodhpur hotel. It takes a little more than five hours to reach the desert city of Jaislamer. Just before Jaisalmer stop and visit Jaisalmer War Memorial. You can get a lot of information on the Indian Army. There is a lot of information about the Indo-Pak wars. Check into a hotel on arrival in Jaislamer. Have a nice lunch and relax for some time. In the afternoon start for Sam Sand Dune. On the way, stop at Kuldhara Abandoned village. This village is often referred to as ghost village. It is said this village became deserted all of a sudden. 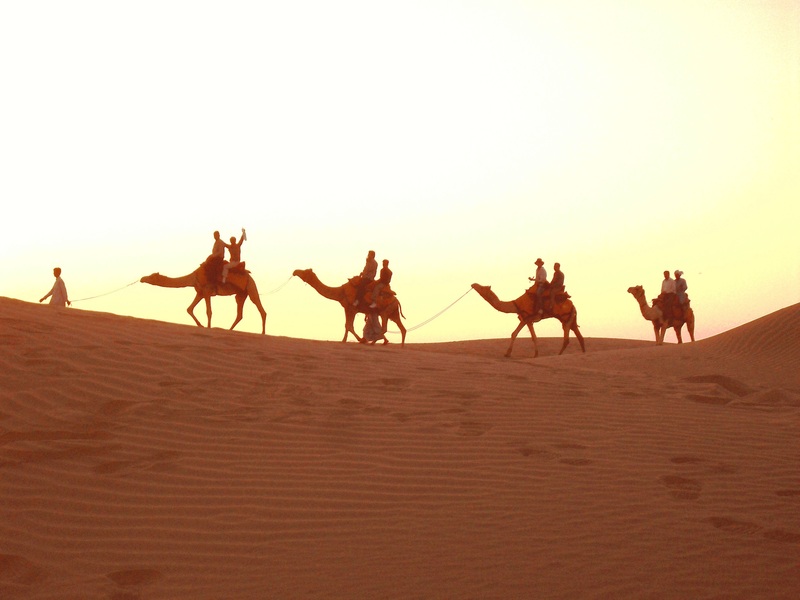 Enjoy Sam Sand Dune desert and enjoy camel ride. Sunset from the dune looks amazing. Attend cultural show in the evening organized at various camps. Have your dinner there. Return to your hotel. Overnight in Jaisalmer. Day 9: Jaisalmer: After breakfast embark on a full day sightseeing tour of Jaisalmer. Start the day with a visit to Jaisalmer Fort, locally known by the name ‘Sonar Quila’. Located on Trikuta Hill; Jaisalmer Fort, a UNESCO World Heritage listed monument, was built by Rawal Jaisal in 1156. There is a museum and Jainese temples in the Fort. Have a comprehensive tour of the Fort. Afterwards, go on to visit Patwon Ki Haveli, the most important among the havelis in Jaisalmer. It is actually a cluster of five small havelis. The first among these havelis was commissioned and constructed in the year 1805 by Guman Chand Patwa and is the biggest and the most ostentatious. A number of paintings and mirror works can be seen on the walls of these havelis. Visit Vyas Chhatri, the cenotaphs, located at the edge of the town. There are other havelis and small palaces to explore. Go onto visit Gadsisar Sagar Lake close to sunset and enjoy boating in the lake. You can explore the markets in Jaisalmer on foot. Have dinner at one of the restaurants. Overnight in Jaisalmer. Day 10: Jaisalmer – Jodhpur: Check out after breakfast in the morning and drive to Jodhpur. Just before reaching Jodhpur, go on to visit Balsamand Lake. This a big lake with an old palace near it. The palace has been converted to a hotel. It has a lovely garden. Have your lunch there. Check in a hotel on arrival in Jodhpur. You can choose to relax. But if you feel like going out, then go out to explore Umaid Bhawan Palace, one of the largest royal residences in the world. It was built by Maharaja Umaid Singh in Chittar Sandstone with the intention of providing public relief and employment during a long period of drought. Spend some time at Umaid Heritage Art School learning to paint. Return to the hotel and have dinner. Overnight in Jodhpur. Day 11: Jodhpur – New Delhi: Check out after breakfast at the hotel. Go to the airport and catch your flight to New Delhi. On arrival, transfer to a hotel near airport in New Delhi. Spend the rest of the day at leisure. You are free to visit somewhere in the city if you want. Have an early dinner and leave for airport to catch your flight for onward destination.